Did you guess a stationary bike? You may remember some blog posts over a year ago about my forays into the French healthcare system. What you may not remember is the reason I had those adventures. I suddenly developed a very painful, very arthritic left knee. Well, it probably took years to get that way; it just manifested itself very suddenly. My medical treatment has me walking more easily, but not as well as I'd like. As luck would have it, a friend who has a second home here in Cadrieu is a well-respected physician whose specialty is...ready for it?...knee surgery. He concurred with my general practice physician that I can walk all I want, but to strengthen the muscles in my leg to better support my knee, I must cycle. Okay, here's the deal. I live in a village built on a hillside...not conducive to riding a bike. I live right on a very flat road that people do cycle on. Laury regularly cycled into Cajarc. I see families on bicycles during the summer, and there are packs of boys in lycra who whiz by year 'round. However, I feel uncomfortable on this road on a bicycle. It's very narrow with no shoulder, much less a bike lane, along most of it. Although it's only really busy a couple of times during the day, cars, buses and trucks do speed by. A lot of the road is lined by stone walls that come right to the pavement. 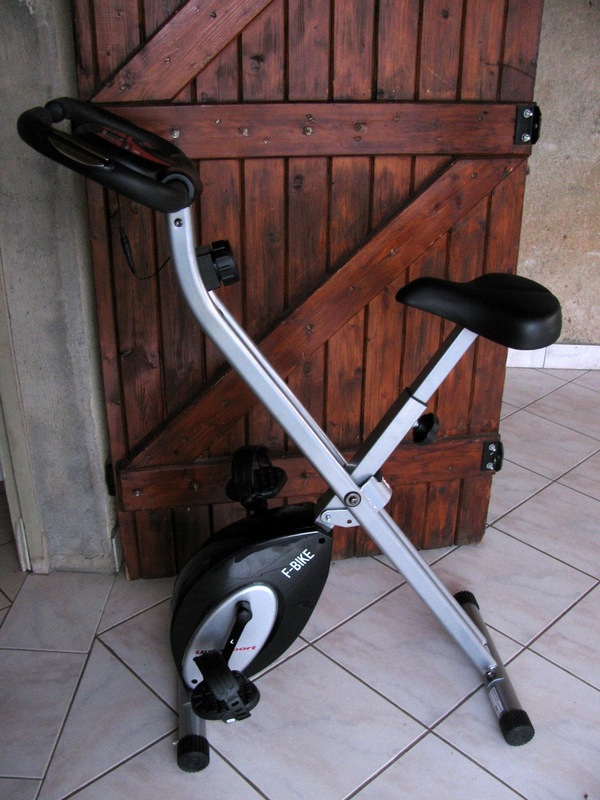 After a lot of reading, looking at what's available, and checking my bank account, I decided that a simple stationary bike would be my best option. I'm not training for the Tour; I just want to strengthen some muscles! I ordered it from Amazon.fr with a bit of trepidation about its assembly. It arrived at 12:30 pm, and by 1:30 pm I was pedaling away...very easy to put together. It has 8 levels of intensity and a digital display that tells me distance, speed, calories burned and my pulse rate. Perfect! I was a little reluctant to buy something that doesn't actually go anywhere, but this certainly has advantages: it will strengthen my muscles and burn a few calories, I won't wobble in front of an oncoming bus and become road kill, and I don't have to wear lycra. Gotta love it! Plus with it set up in my sun room, I can watch the river flow by as well as the traffic on the road. Which, I hope, will help with the boredom factor. Better stop...must go pedal a little! That is a stylish little exercise bike! Hooray for the exercise and the improved knee and especially for not getting mowed down by public transit :D Have fun! Love the wooden door behind the bike! And the view of the river sounds conducive to pedaling. Have fun pedaling! This sounds fun!!! It would be good for Seattle too with all the rain we have! Hope to get to France sometime soon ^_^! Good luck. I am far too impatient to do anything like that and would get bored within 5 minutes. I prefer the real thing, which certainly keeps you fit with the hills around here but is only practical outside the winter months. At least you can pedal away all year round.